Thanks for blogging with us today! been busy scrapping the day away. Check out their projects here! Here is a close up of the flowers and the butterflies. Here is a close up of the smaller photo mats and the vellum quote. I used the Quick Quotes Club Q kit from August. It contained the bracket frames, chipboard butterfly as well as the beautiful Miss Morgan Designer Paper. Note: When this kit is sold out, you can easily recreate this layout by purchasing the beautiful Miss Morgan papers and utilizing your Cricut to cut out the bracket frames and butterflies. 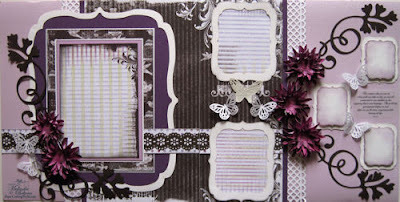 I used my Midnight Confessions and Purple Passion Powder Puff Chalk Inks to ink the edges of the mattes the the flowers. I used Light, Medium and Dark Purple Bazzill cardstock as well as brown and white. I used my Lovely Floral Cricut Cartridge to cut the flourishes and the Bloom Cartridge for the flowers. 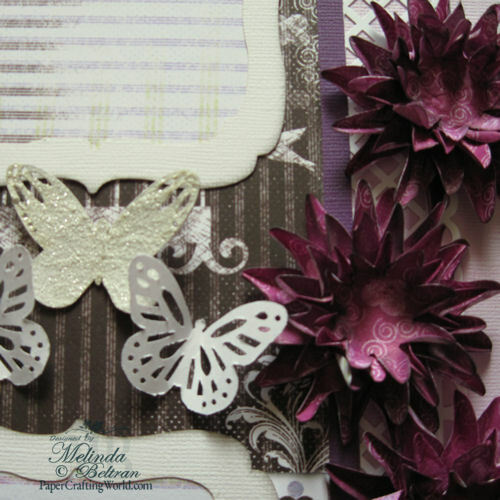 The cardstock Butterflies, and borders were created from some punches. I finished off the chipboard butterfly with some distress stickles. Lastly, the beautiful quote is from the Babies, Kids and Families Itty Bitty quote box set. Description/tips/techniques: I matted the photo with black cardstock. I left a small mat at the top and a slightly larger portion of mat at the bottom of the photo. I did not leave a border along the sides of the photo. I wrapped the ribbon around the bottom mat. 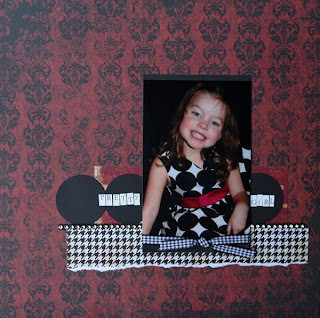 The ribbon created a border between the photo and cardstock. The 3-in-1 Beacon glue is great for adhering the strip of gems. I used my circle punch to create the border of circles. These were inspired from the circles on my daughter’s dress. I like to create a textured look by tearing pattern paper. I like to leave a white torn edge to give a look of depth. Click here for the latest challenge! Beautiful Layouts Ladies! Thanks for the inspiration.